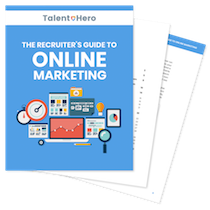 There are hundreds, if not thousands of recruitment blogs, available across the Internet. Sadly, most of them are dead, dying or simply not worth reading. Fortunately, there are a few diamonds in the rough and we’ve listed the top 17 here. Check out our list of the best recruitment blogs and add any of your favorites in the comments. If enough people recommend a specific one, we’ll add it the list. Bonus Content: No time to read this list right now? 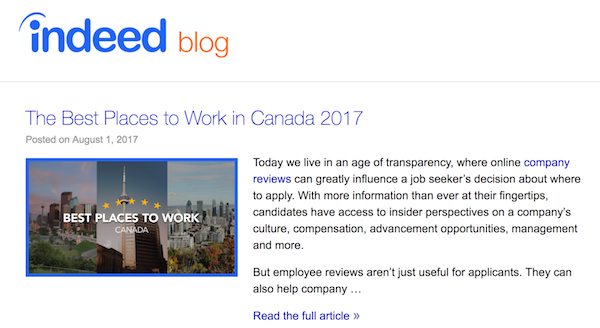 Download a free PDF version and get a list of 17 blogs for recruiters to read. 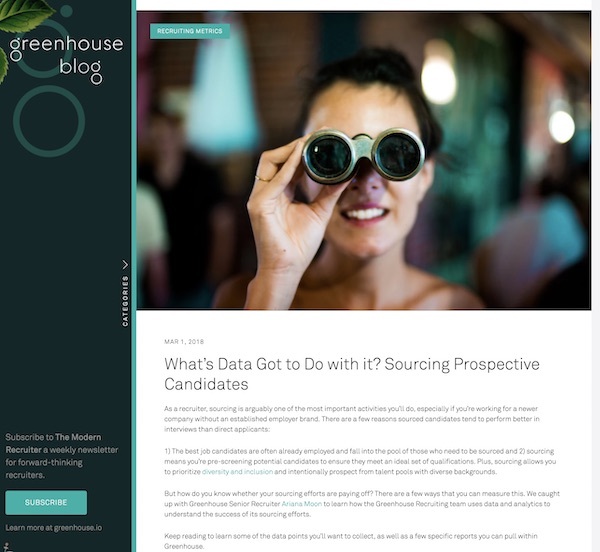 Greenhouse is one of the hottest applicant tracking systems on the market, which should not come as a surprise if you check out their blog. Publishing at least one new post per week (and often two or three), the Greenhouse blog tackles recruiting from every angle imaginable. The blog’s greatest strength is its diverse set of opinions. Not content to just post what they themselves know, the Greenhouse team scours the Internet for guest posts from the best and brightest minds in recruiting. Helpful tip: If you like what you see, sign up for the The Modern Recruiter newsletter to get their latest posts sent straight to you on a weekly basis. 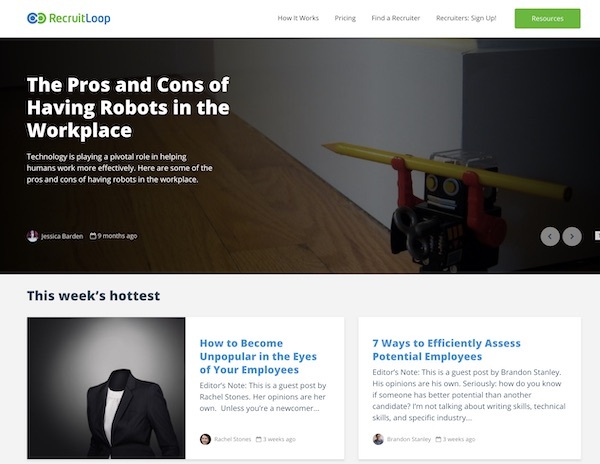 RecruitLoop is another company blog that stands out in a very crowded market. The differentiator for this blog is the diversity of its topics. Not content to stick solely to recruiting, RecruitLoop tackles related topics like how to grow a small business, why telecommuting can save businesses money and how to hire a professional content writer. If you are sick and tired of reading exclusively about recruiting, this blog is a solid diversion. 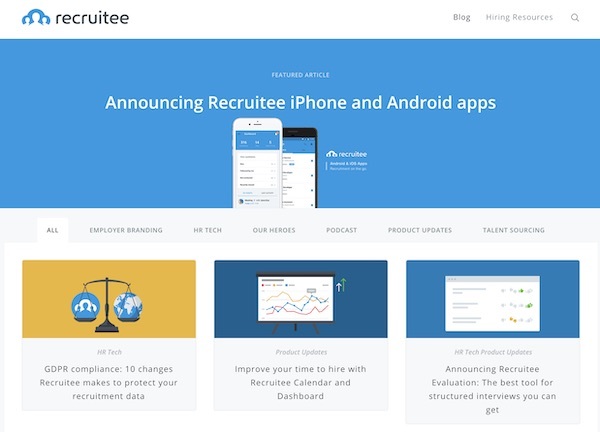 Recruitee, developers of an industry-leading applicant tracking system, doesn’t just know how to code. They can write too! 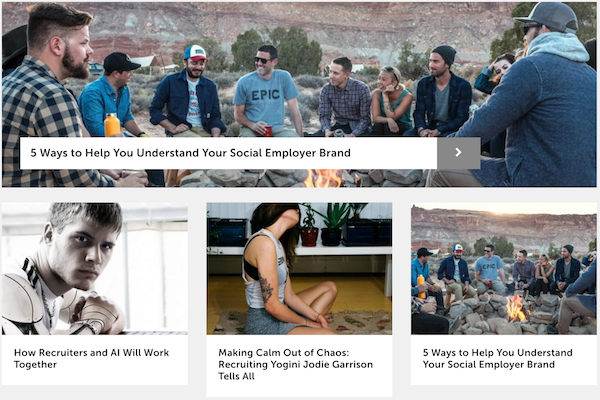 This blog has it all including tips on employer branding, HR tech and talent sourcing. One of the best aspects of this blog is the mix of how-to’s such as this post on SEO Keyword Research For Job Pages with more touchy-feely subject such as How to improve the candidate experience. 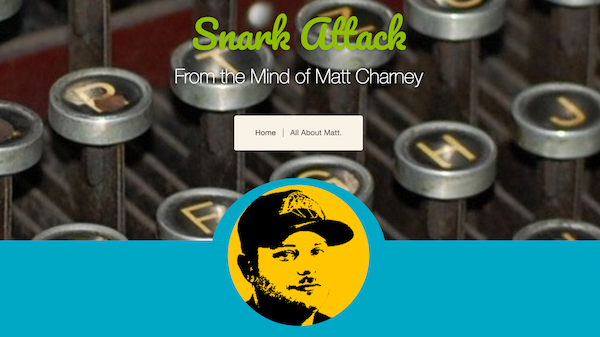 “Matt Charney is probably the world’s top expert when it comes to talent and technology. If you want to know what’s cool, what’s new or what’s next in recruiting, all you have to do is ask Matt.” – Dr. Peter Cappelli, The Wharton School. Matt Charney receives high praise from his peers for good reason: he brings the goods. Not afraid to step on a few toes, Charney’s Snark Attack recruiting blog is filled with refreshing commentary on the state of the recruiting industry written in a unique style that is uncommon in the business. Despite its name, SourceCon is not just a conference focusing on sourcing. It’s also a repository for a surprisingly large number of articles on this niche topic. 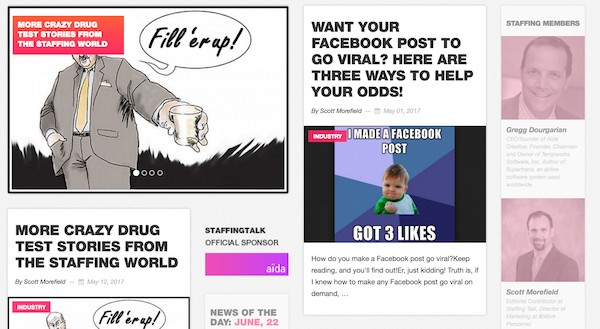 The beauty of this blog is that it focuses on actionable articles rather than fluffy pieces. With prosaic titles like “The Wonderful World of Chrome Extensions” and “Targeting Location to Search on LinkedIn”, this site is clearly about substance over style. Helpful tip: If this blog appeals to you, check out the sourcing tools available in Tools For Recruiters: The Complete List. 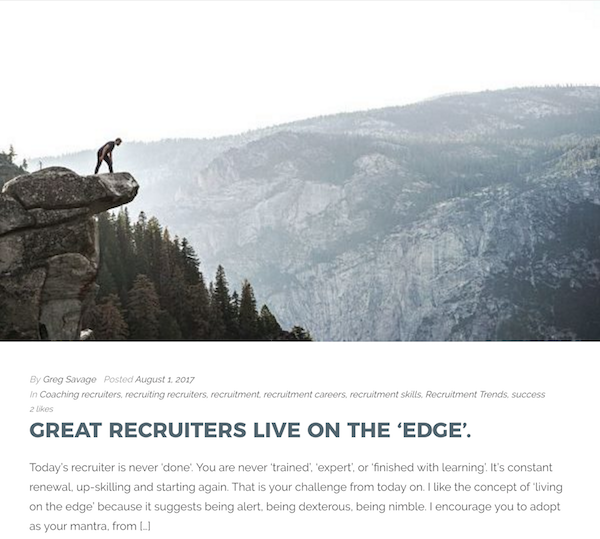 Indeed is one of the biggest players in the job market, let alone the recruiting industry and you might not think that this 800 pound gorilla would be putting out useful content on their recruitment blog. Think again. For a recruiting blog run by a large corporation, Indeed’s posts are surprisingly valuable. They have a weekly roundup of labor market links and write insightful blog posts using their abundance of data (their post on trends in job tenure is quite good). They do one other thing that nobody else can – they regionalize their content, meaning that you will find articles specifically tailored to where you live directly in their feed. 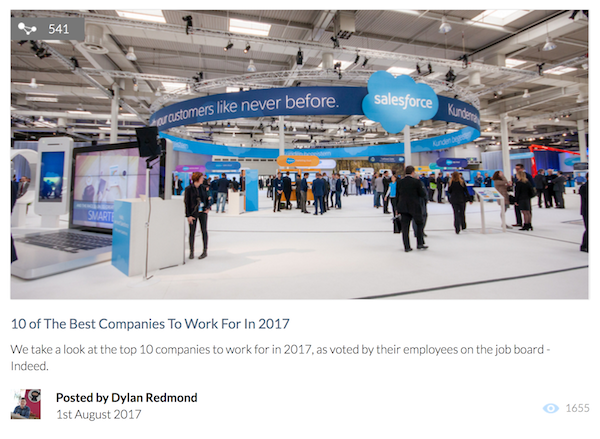 Though Katrina doesn’t post as often as many of the other recruitment blogs on this list, she gets a special shout out for the quality of her content. The Searchologist is a blog focused on social recruiting and each post is a peak into the mind of someone who has a clear expertise on the subject. What I like most about these posts is the clear intent to show you how to take immediate action rather than sit back and ponder nebulous advice. After 37 years in the industry, when Greg Savage talks, recruiters listen. The founder of four successful recruiting businesses, this advisor to the recruiting industry puts out posts on a variety of topics and also manages to fit in a bi-weekly Sixty Savage Seconds, a one minute video on a single small topic. With a list of categories so long that it took me 5 seconds to scroll to the bottom, you can be certain you’ll find something that is relevant to you. Social Talent is an Irish startup that provides online and social media training to the recruitment industry so it is no surprise that they also excel at sharing their knowledge in blog form. Over the past 8 years, this content marketing juggernaut has produced over 1,650 articles on a recruiting blog that spans the breadth of the recruiting world. Their weekly series, The Roundup, is a great way to stay on top of the latest news in the industry and of course, their social media posts are a great way to learn about how to use social media to up your recruitment game. If you want a hub for all things recruiting, this is where you need to go. Featuring at least one new post per day, a monthly podcast and a list of conferences and articles on recruiting tools, Recruiting Blogs, which is technically an aggregation of multiple recruitment blogs, is a comprehensive source for all things recruiting. How do they put out so much high-quality content? The site allows anyone to write a post but carefully reviews each one to ensure that they meet the site’s standards. The Undercover Recruiter is a prolific content machine, releasing a plethora of insightful pieces on an impressively frequent basis. 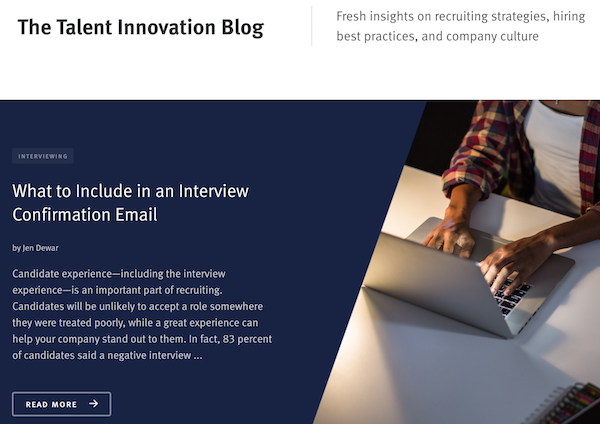 The blog focuses on all sides of the recruiting business with articles that meet the needs of people in the job market, HR professionals and full-time recruiters. They are able to cover this much ground by sourcing articles from a diverse set of backgrounds. Helpful tip: You can use the Sections menu at the top of the page to find the articles that are the right fit for you. Juice is a provider of highly engaging courses for recruiters so it should be no surprise that their blog content also lives up to their high standards. With posts coming out at a breakneck speed for a small company, you can be sure that you will find an insightful new article each week. As for the topics, they cover a wide range but have an obvious focus on technology and social media, two areas that are critically important for the modern-day recruiter to understand. The TalentCulture blog never rests with content on a range of topics being released on a daily basis. Founded by Meghan M. Biro, the TalentCulture mission is to “connect and engage professionals who want to understand and shape the human aspects of business” and this recruiting blog is just one part of the TalentCulture site that fosters that goal. With a regular podcast and Twitter chat, TalentCulture helps recruiters and other talent specialists stay on top of their game. Lever’s main focus is developing an industry-leading ATS but they also find the time to create a blog on recruiting that has some outside-the-box takes. While there are plenty of articles on recruiting favorites such as interviewing and sourcing, there are also more unconventional thoughts on topics such as using design thinking to create recruiting metrics. As a data nerd myself, my favourite category is data-driven recruiting, a topic that is discussed with ever-increasing frequency but still not given the prominence it deserves. This site may be old (founded in 1998, it may just be the first of the recruitment blogs) but it is not yet showing its age. From the same company that brought you SourceCon, ERE Media, ERE is your hub for opinion pieces on the state of the industry and where things are headed. Helpful tip: The front page makes it look like there is a very limited amount of content available. This is not the case. There are actually many more posts that are available within hidden category pages. To find a list of categories, go here and then scroll through the list, keeping a careful eye on the categories that are at the bottom of each post. Sourcing content from around the Internet, a Fistful of Talent knows that the best way to find useful articles is to get the leaders in the industry to post on your site, which is exactly what they’ve done. With their key contributors listed across the top of the home page, you can instantly see some of the top names in the industry on the site. Furthermore, they’re one of the few recruitment blogs that has managed to update a video series on a regular basis. 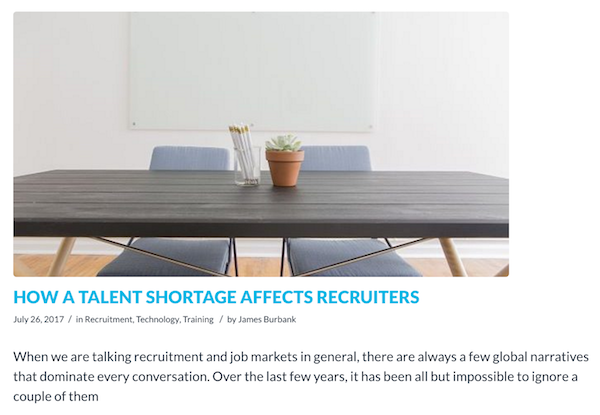 Staffing Talk is not quite like most of the recruitment blogs on this list. 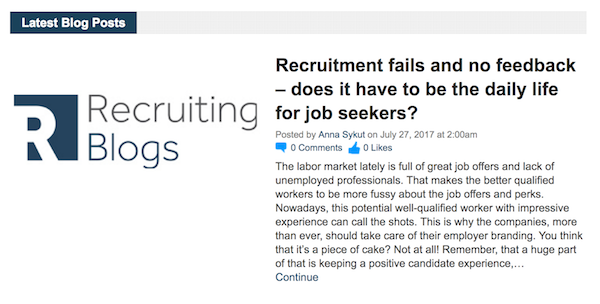 With a combination of recruiting news and lighter stories (“More Crazy Drug Test Stories From The Staffing World” is typical fare), this blog is a place to go when you want to stay on top of news in the staffing industry but don’t want to think too much.